Yay, holidays. They're pretty much over now, but I had an amazing week and a half of not very much going to work and lots of time with family and friends. And I had a good time dressing for the season! 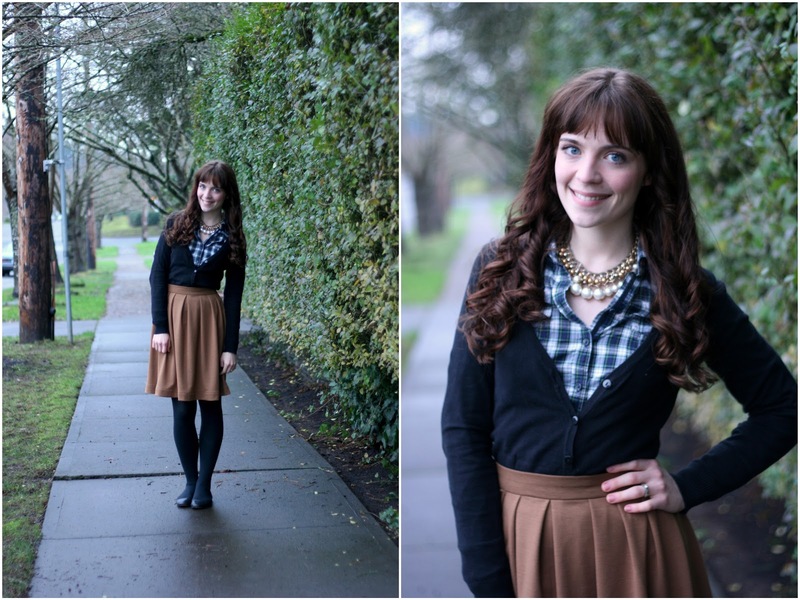 I even got a chance to wear the brown skirt I've been so excited about making for ages--I finally made it this fall, along with two others that didn't require patterns, and I'm glad I was able to make it work for a festive winter look. All three skirts have warm fall colors, but I refuse to retire them with the falling leaves! I wore this to work and then to a family dinner after work--love the versatility. And the length of the skirt, which makes it not too youthful and playful for work but also not at all dowdy. That's one fantastic thing about making your own clothes--you can make whatever length you please, thank-you-very-much,-society. Sweater: H&M via Goodwill. Shirt: Old Navy via Goodwill (similar). Necklace: Target via Goodwill. Flats: Land's End Overstocks. 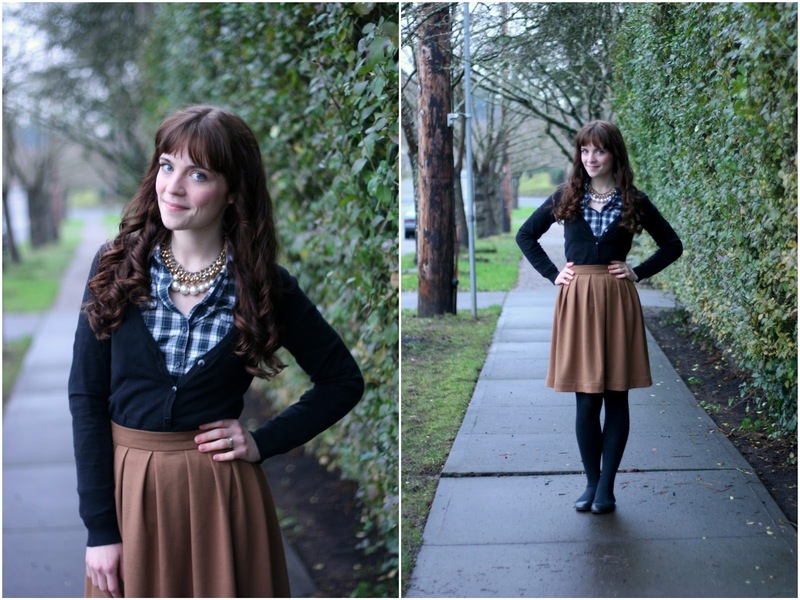 Skirt: DIY, no pattern and simple construction! I also rocked the teal and white fair-aisle print scarf, several chunky cable knit sweaters, broken-in riding boots, and a red plaid flannel shirt at different times over the holidays. What were your fave outfits this holiday season?? I think this is one of my favorite outfits of yours! I start student teaching this month, and this tall lady has been in need of some longer skirts. This is a perfectly put together, pretty but school appropriate outfit. Such an adorable combo, I love anything in camel/caramel shades! That outfit is adorable and the skirt is fantastic! Can't believe you made it without a pattern! I love the color of your hair, Suzannah - it really brings out your eyes! You have a great blog! We would love to collaborate with you! Please email us if you are interested in guest blogging with us one of your dresses! Great outfit - that skirt is so simple, yet so stylish!